Maravilla 1114 is optimally positioned on the north corner of building #1 at Maravilla. Close proximity to both the beautiful north pool and the pet walk makes this property one of our most convenient and popular locations in all of Maravilla. 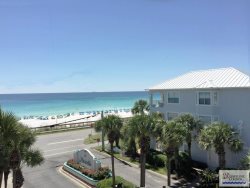 Touting one of the largest private beaches along Scenic Gulf Drive, Maravilla is a Destin landmark and graciously welcomes families and couples alike. This property at Maravilla is small dog pet friendly, so you can bring your family doggie with you and enjoy the convenience of the close petwalk and lots of grassy area for walking. This classic beach condo features tile floors throughout and is decorated in pleasing tropical prints and pastels. Of course, the living area takes full advantage of the quiet patio and pleasing environment where you can enjoy the salt air blowing gently off the Gulf waters. A glass round wicker table and 4 chairs welcome you to relax and take in the beauty and surroundings, while sipping a glass of your favorite beverage, or playing a round of cards with your fellow travelers. A spacious master bedroom hosts a king size bed, a tub/shower bath, and private sliding glass door access to the porch and the beach, only a short stroll beyond. Just grab your water bottle and new novel to read, and walk to the beach where the white sand is waiting! The guest bedroom offers a queen bed and easy access to the full hall bathroom. A TV in every room allows evening entertainment while winding down from a sunny day at the beach or one of the beautiful pools at Maravilla. Maravilla 1114 is also located near the only hot tub at Maravilla – it seats 10 and is warm year round – located at the private north pool. Find some ‘fitness time’ inside the clubhouse with several updated workout stations. Maravilla also offers newly surfaced tennis courts, so bring your racquet and tennis balls, or watch others compete on the smooth playing surface. It’s first come, first ‘serve’ for guests and owners. Book your time at Maravilla 1114 now by clicking the online booking button above. Then, return every year for your annual beach vacation to this wonderful property!